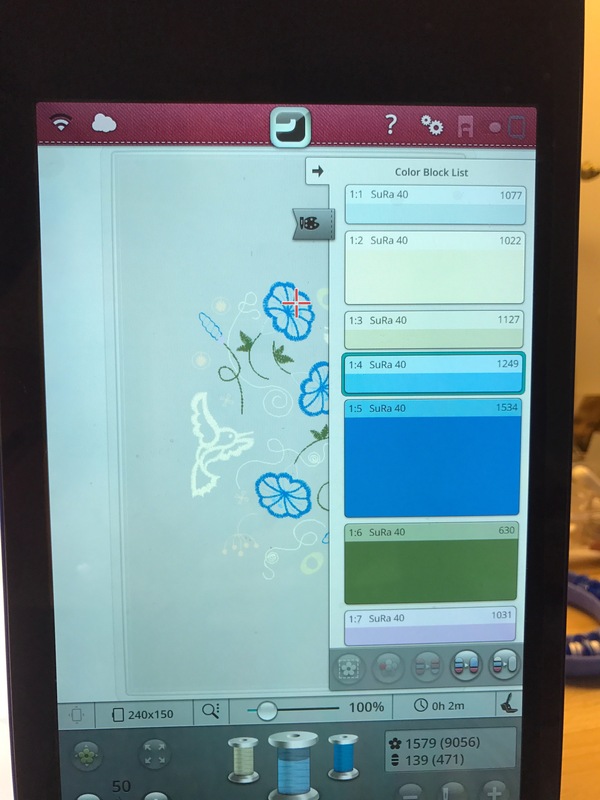 ← diary of a quilt block with a bird’s nest! I cannot believe that my wonderful Husqvarna Epic machine is nearly a year old. I have so enjoy using it that it has taken me too long to blog further about it. I thought you would like me to share my favourite features of this machine, one year on. 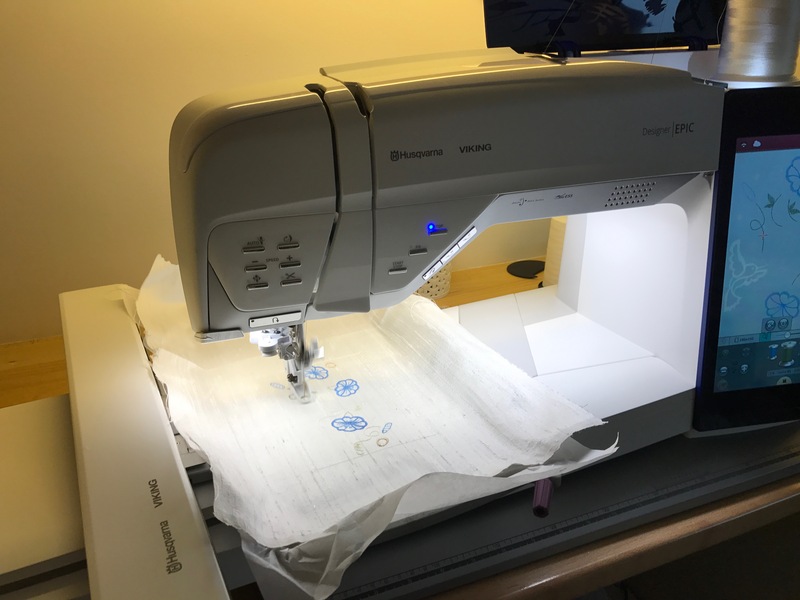 Today I was stitching out a new design whcih will be part of Morning Grunge 2 to be released in a few days, and I thought I would take this opportunity to show you what I love most of all about my machine. Firstly I love the way it lights up my sewing studio as it stands in pride of place. 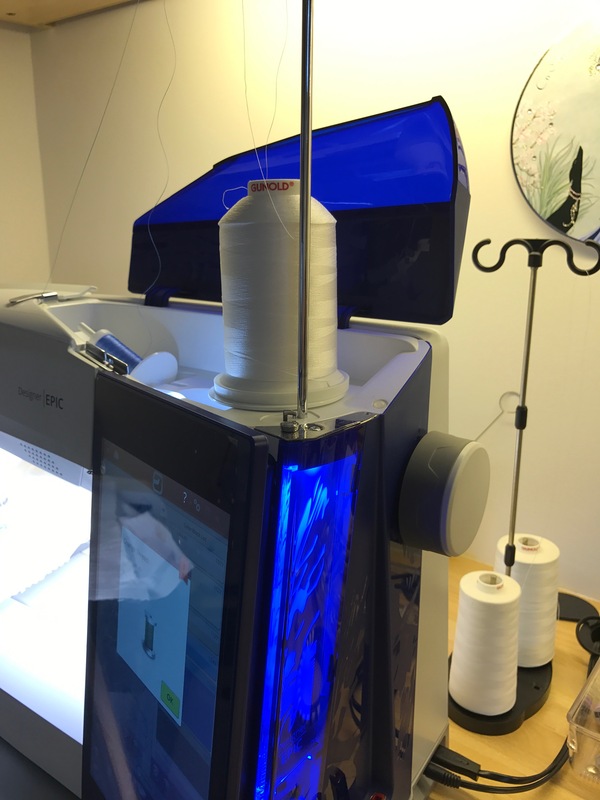 Notice that I have hooped a layer of stitch and tear, added another layer with temporary adhesive and then added my silk dupion on the top, using the fixing feature on the machine to hold it all in place. I tend to lay the left hand spools on their side which keeps them out of the way and avoids any tangles. 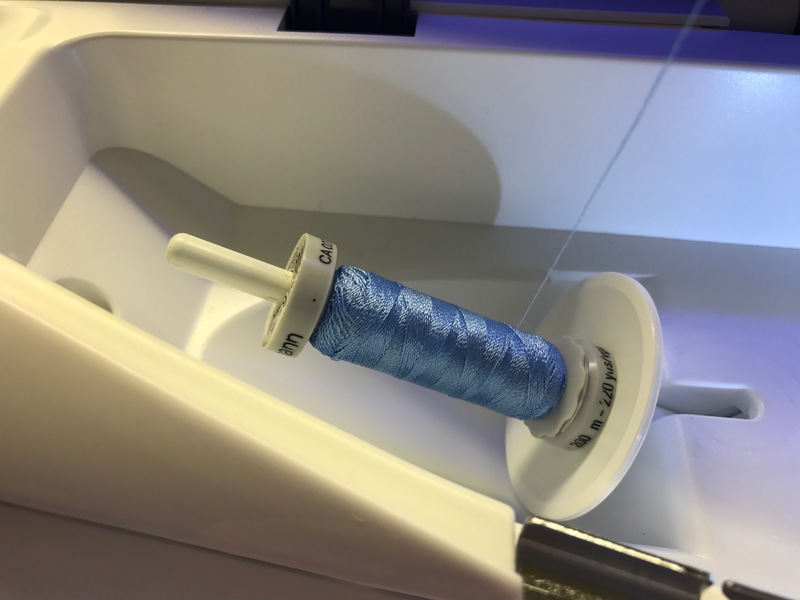 This is a marvellous feature as the thread is well clear of any rough edges on the spools that can cause problems. 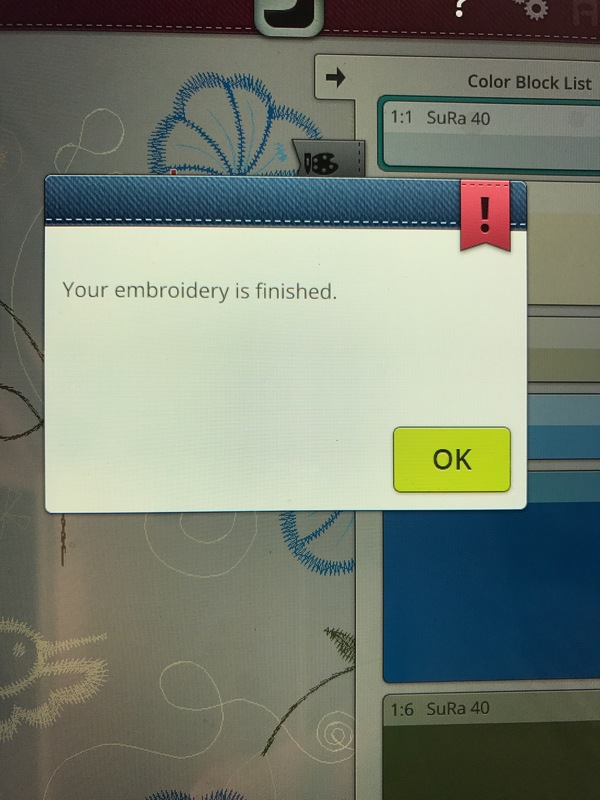 I find embroidering so easy now with this huge screen, and I was delighted when they brought the timer back. It is also great to have two upright pins for spools of thread. I use the right hand side for my favourite large spools of off white and cream! Behind the machine you can see my bobbin refill stand, although I am now looking forward to using some pre wound bobbins that are available from my dealers. 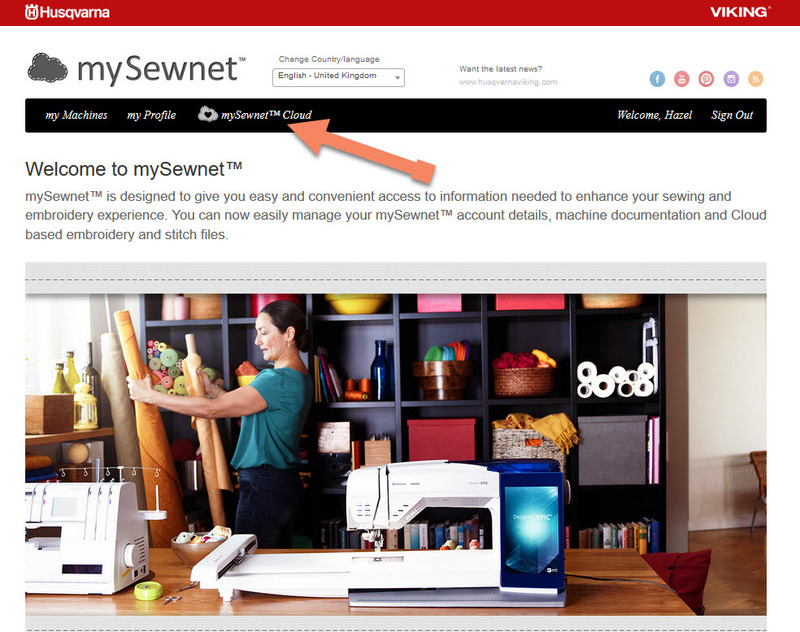 My first impression of the cloud storage, my SewNet was not good, but Husqvarna seem to have sorted it out now and I experience little difficulty. The important thing to remember is that you do not have a huge amount of space. 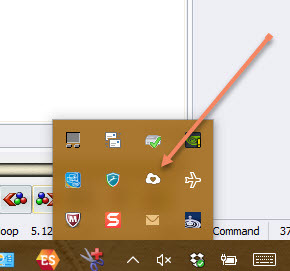 There are several ways to access it but my preferred method on my computer which has Windows 10 installed, is to go the lower right of the screen and click on the upwards pointing arrow which displays your hidden icons. You may not have to do this if you don’t have so many programmes listed in your taskbar as I do. Click on the cloud with the open heart. 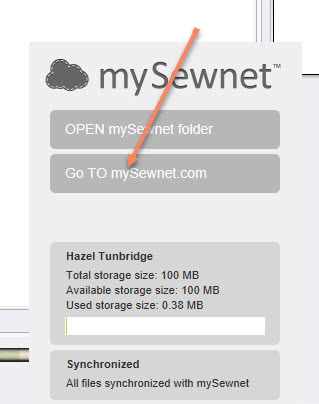 When the grey box opens I select mySewnet.com which I prefer to use as I am actually entering this cloud. This the webpage and you will need to sign in. 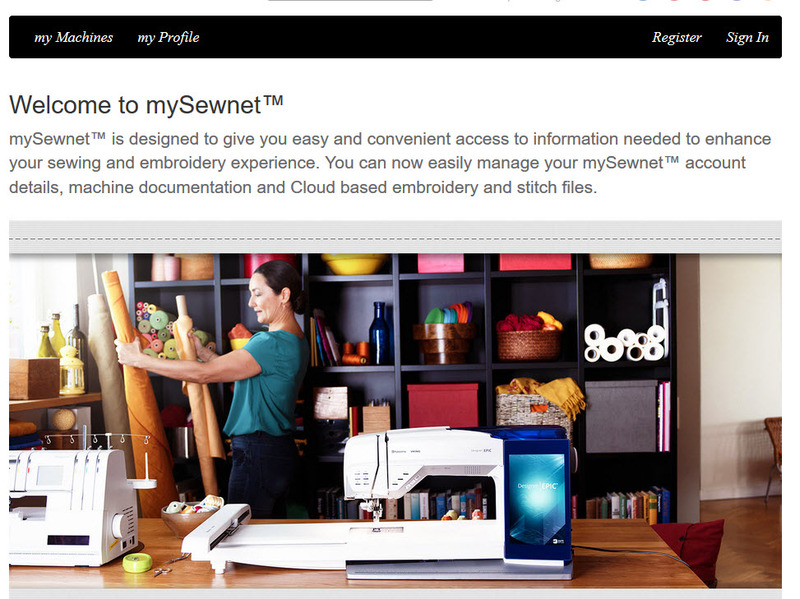 Once you are logged in you can access mySewnet™cloud. Do not keep too many designs files there. If you are replacing a file with an updated one and it refuses to upload the new version, log out and log back in again. 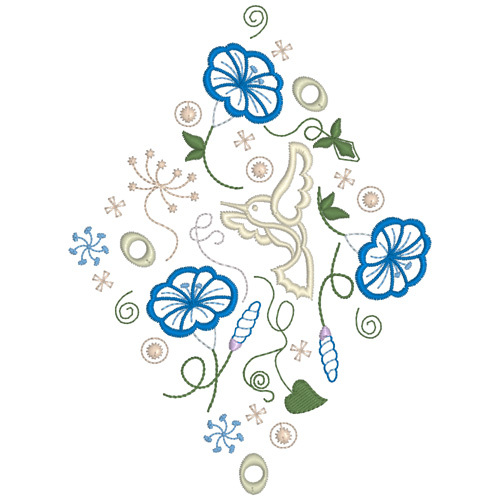 Obviously the rate of stitches per minute is excellent too, so my embroideries take less time to test out. 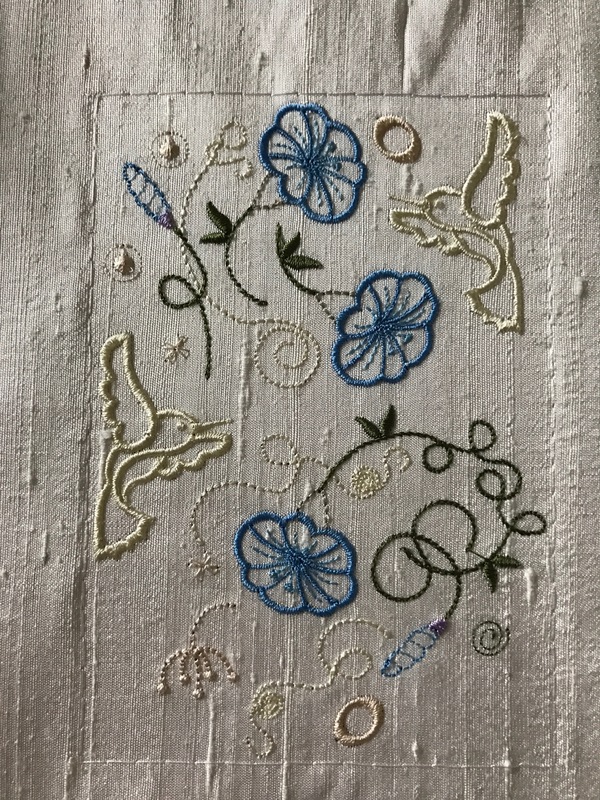 Every time I see the finished screen I am delighted at what I have embroidered and am excited by what I will be able to stitch next! Now this was a 5″ by 7″ design I was testing, but I have to admit that one of the best features of this machine are the huge 260mm wide hoops. 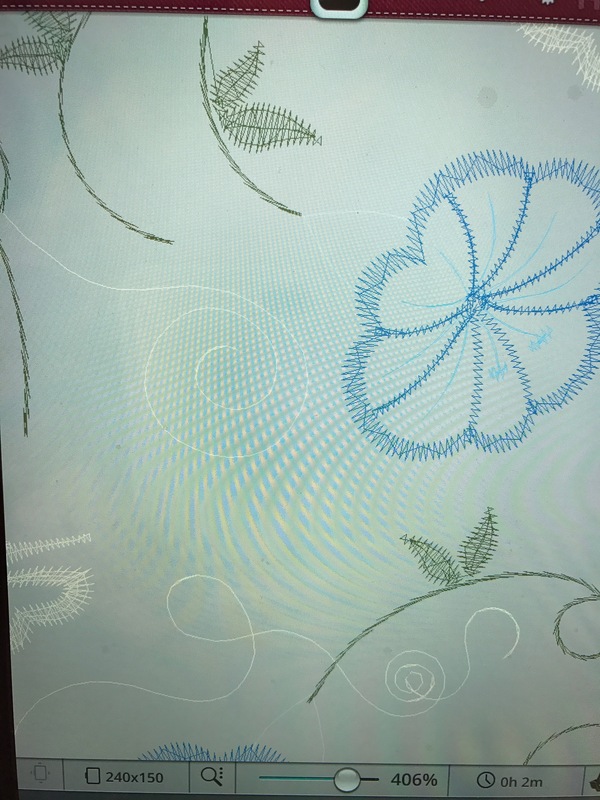 I do hope that Husqvarna brings out a 260mm square hoop soon, as I find the results are always better using square hoops and just think of the possibilites for quilting. I don’t usually place my silk dupion so the lines of the fabric are vertical but it worked nicely for this design, giving the hummingbirds lift. I have used Sulky Rayon 40wt thread for the stitch out. There are 15 designs in this new set which is part of the Morning Grunge collection. I particularly love this diamond shaped design. The set is due for release later this week and contains some lovely borders. 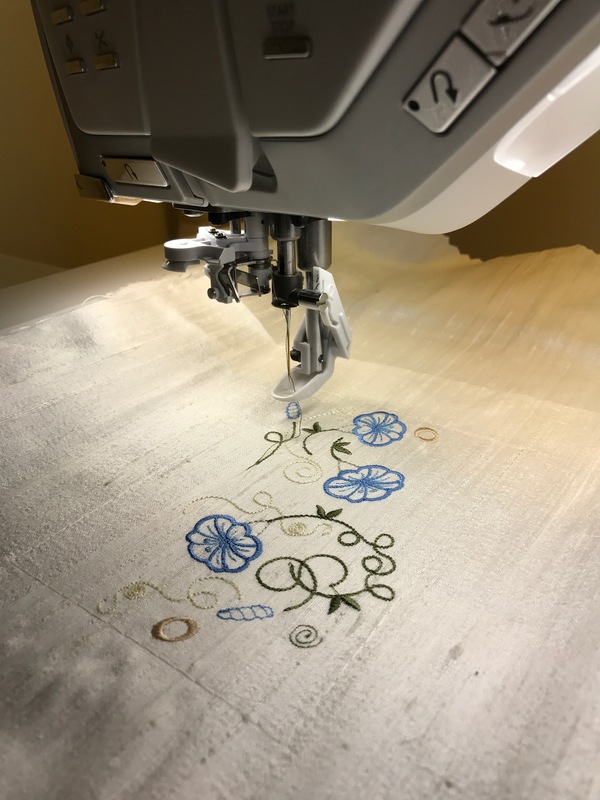 This entry was posted in Discussing machine embroidery, Embroidery machine review, New Designs and tagged combining embroidery designs, development of embroidery, embroidery on silk, Husqvarna Designer Epic. Bookmark the permalink.